Examination of the foregoing table reveals that there are a handful of fundamental ways that antibacterial antibiotics work as therapeutic agents. Recall that the target of an antibiotic should be unique to the bacterium and not found, or not accessible to the antibiotic, in the patient. These are the most important targets in bacteria that have been exploited so far. 1. Attack bacterial cell wall synthesis. Bacteria have murein in their cell walls, not found in the host, and murein (peptidoglycan) is essential to the viability of the bacterium. 2. Interfere with protein synthesis. Attack is almost always ate the level of translation using 70S ribosomes in the translation machinery. 70S cytoplasmic ribosomes are absent in eucaryotes. 3. 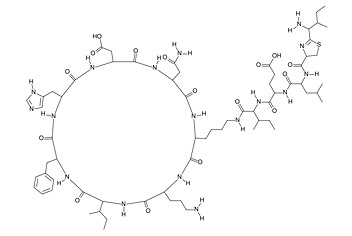 Interference with nucleic acid synthesis (RNA and DNA), which exploits differences between RNA polymerases and DNA replication strategies in bacteria and eucaryotes. 4. Inhibition of an essential metabolic pathway that exists in the bacterium but does not exist in the host. This is usually brought about through the use of competitive chemical analogs for bacterial enzymatic reactions. 5. Membrane inhibition or disruption doesn't work too well because of the similarities between eucaryotic and bacterial membranes. However, the outer membrane of Gram-negative bacteria is a reasonable point of attack and some membrane inhibitors are included in the discussion below. Cell wall synthesis inhibitors generally inhibit some step in the synthesis of bacterial peptidoglycan. They exert their selective toxicity against bacteria because humans cells lack cell walls. Beta lactam antibiotics. Chemically, these antibiotics contain a 4-membered beta lactam ring. They are the products of two genera of fungi, Penicillium and Cephalosporium, and are correspondingly represented by the penicillins and cephalosporins. Chemical structures of some beta-lactam antibiotics. Clockwise: penicillin, cephalosporin, monobactam, carbapenem. Note the characteristic structure of the beta lactam ring. The beta lactam antibiotics are stereochemically related to D-alanyl-D-alanine, which is a substrate for the last step in peptidoglycan synthesis, the final cross-linking between between peptide side chains. Penicillins bind to and inhibit the carboxypeptidase and transpeptidase enzymes that are required for this step in peptidoglycan biosynthesis. Beta lactam antibiotics are bactericidal and require that cells be actively growing in order to exert their toxicity. Different beta lactams differ in their spectrum of activity and their effect on Gram-negative rods, as well as their toxicity, stability in the human body, rate of clearance from blood, whether they can be taken orally, ability to cross the blood-brain barrier, and susceptibility to bacterial beta-lactamases. Natural penicillins, such as penicillin G or penicillin V (benzyl penicillin), are produced by fermentation of Penicillium chrysogenum. They are effective against streptococci, gonococci and staphylococci, except where resistance has developed. They are considered narrow spectrum since they are not effective against Gram-negative rods. Penicillin G (Benzylpenicillin) is typically given by parenteral administration because it is unstable in the acid of the stomach. However, this achieves higher tissue concentrations than orally-administered penicillins and this increases its antibacterial potential. "PenG" may be used in treatment of bacterial endocarditis, gonorrhea, syphilis, meningitis, and pneumonia. Semisynthetic penicillins first appeared in 1959. A mold produces the main part of the molecule (6-aminopenicillanic acid), which can be modified chemically by the addition of side chains. Many of these compounds have been developed to have distinct benefits or advantages over penicillin G, such as increased spectrum of activity (effectiveness against Gram-negative rods), resistance to penicillinase, effectiveness when administered orally, etc. ; amoxicillin and ampicillin have broadened spectra against Gram-negative bacteria and are effective orally; methicillin is penicillinase-resistant. The semisynthetic beta-lactam, amoxicillin. Amoxicillin is usually the drug of choice within the class because it is better absorbed following oral administration than other beta-lactam antibiotics. It is susceptible to degradation by bacterial beta-lactamase enzymes so it may be given with calvulanic acid (below) to decrease its susceptibility. It is used against a wide range of Gram-positive bacteria, including Streptococcus pyogenes, penicillin-sensitive Streptococcus pneumoniae, non beta-lactamase producing strains of Staphylococcus aureus and Enterococcus faecalis. Susceptible Gram-negative organisms include non beta-lactamase producing strains of Haemophilus influenzae, Neisseria gonorrhoeae and N. meningitidis. Clavulanic acid is a chemical sometimes added to a semisynthetic penicillin preparation. Thus, amoxicillin plus clavulanate is clavamox or augmentin. The clavulanate is not an antimicrobial agent. It inhibits beta lactamase enzymes and has given extended life to penicillinase-sensitive beta lactams. The structure of calvulanic acid. Clavulanic acid is not an antibiotic. It is a beta-lactamase inhibitor sometimes combined with semisynthetic beta lactam antibiotics to overcome resistance in bacteria that produce beta-lactamase enzymes, which otherwise inactivate the antibiotic. Most commonly it is combined with amoxicillin (above) as Augmentin (trade name) or the veterinary preparation, clavamox. Although nontoxic, penicillins occasionally cause death when administered to persons who are allergic to them. In the U.S. there are 300 - 500 deaths annually due to penicillin allergy. In allergic individuals the beta lactam molecule attaches to a serum protein and initiates an IgE-mediated inflammatory response. 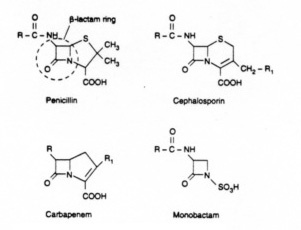 Cephalosporins are beta lactam antibiotics with a similar mode of action to penicillins. They are produced by species of Cephalosporium molds. The have a low toxicity and a somewhat broader spectrum than natural penicillins. They are often used as penicillin substitutes against Gram-negative bacteria and in surgical prophylaxis. They are subject to degradation by some bacterial beta-lactamases, but they tend to be resistant to beta-lactamases from S. aureus. 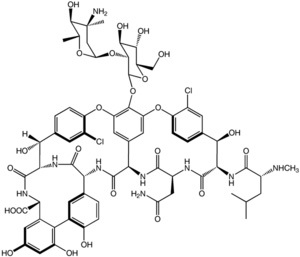 The core structure of cephalosporin. Substituent groups added at position X on the six-membered ring generates variants of the antibiotic. Two other classes of beta lactams are the carbapenems and monobactams. The latter are particularly useful for the treatment of allergic individuals. A person who becomes allergic to penicillin usually becomes allergic to the cephalosporins and the carbapenems as well. Such individuals can still be treated with the monobactams, which are structurally different so as not to induce allergy. Aztreonam is a synthetic monocyclic beta lactam antibiotic (a monobactam) originally isolated from the bacterium Chromobacterium violaceum. It is not useful against Gram-positive bacteria but it has strong activity against a wide range of susceptible Gram-negative bacteria, including Pseudomonas aeruginosa, E. coli, Haemophilus and Klebsiella. Bacitracin is a polypeptide antibiotic produced by Bacillus species. It prevents cell wall growth by inhibiting the release of the muropeptide subunits of peptidoglycan from the lipid carrier molecule that carries the subunit to the outside of the membrane. Teichoic acid synthesis, which requires the same carrier, is also inhibited. Bacitracin has a high toxicity which precludes its systemic use. It is present in many topical antibiotic preparations, and since it is not absorbed by the gut, it is given to "sterilize" the bowel prior to surgery. Bacitracin is a polypeptide antibiotic produced by the licheniformis group of Bacillus subtilis var. Tracy. It is effective used topically, primarily against Gram-positive bacteria. It is used in ointment or cream form for topical treatment of a variety of localized skin and eye infections, as well as for the prevention of wound infections. A popular brand name Neosporin, contains bacitracin, neomycin and polymyxin B.
Cycloserine inhibits the early stages of murein synthesis where D-alanyl-D-alanine is added to the growing peptide side chain. The antibiotic resembles D-alanine in spatial structure, and it competitively inhibits the racemase reaction that converts L-alanine to D-alanine and the synthetase reaction that joins two D-alanine molecules. The affinity of cycloserine for these enzymes is about a hundred times greater than that of D-alanine. Cycloserine enters bacterial cells by means of an active transport system for glycine and can reach a relatively high intracellular concentration. This concentrating effect, along with its high affinity for susceptible enzymes, enables cycloserine to function as a very effective antimicrobial agent. However, it is fairly toxic and has limited use as a secondary drug for tuberculosis. Cycloserine is an oral broad spectrum antibiotic effective against tuberculosis, by inhibiting cell wall synthesis of TB bacilli at the early stages of peptidoglycan synthesis. For the treatment against tuberculosis, it is classified as a second line drug. Glycopeptides, such as the antibiotic vancomycin, inhibit both transglycosylation and transpeptidation reactions during peptidoglycan assembly. They bind to the muropeptide subunit as it is transferred out of the cell cytoplasm and inhibit subsequent polymerization reactions. Vancomycin is not effective against Gram-negative bacteria because it cannot penetrate their outer membrane. However, it has become important in clinical usage for treatment of infections by strains of Staphylococcus aureus that are resistant to virtually all other antibiotics (MRSA). Vancomycin is a glycopeptide antibiotic used in the prophylaxis and treatment of infections caused by Gram-positive bacteria. It has traditionally been reserved as a drug of "last resort", used only after treatment with other antibiotics had failed, although the emergence of vancomycin-resistant organisms means that it is increasingly being displaced from this role by linezolid and the carbapenems. These antibiotics disorganize the structure or inhibit the function of bacterial membranes. The integrity of the cytoplasmic and outer membranes is vital to bacteria, and compounds that disorganize the membranes rapidly kill the cells. However, due to the similarities in phospholipids in eubacterial and eucaryotic membranes, this action is rarely specific enough to permit these compounds to be used systemically. The only antibacterial antibiotics of clinical importance that act by this mechanism are the polymyxins, produced by Bacillus polymyxa. Polymyxin is effective mainly against Gram-negative bacteria and is usually limited to topical usage. Polymyxins bind to membrane phospholipids and thereby interfere with membrane function. Polymyxin is occasionally given for urinary tract infections caused by Pseudomonas strains that are gentamicin, carbenicillin and tobramycin resistant. The balance between effectiveness and damage to the kidney and other organs is dangerously close, and the drug should only be given under close supervision in the hospital. Polymyxin B. Polymyxins are cationic detergent antibiotics, with a general structure of a cyclic peptide with a long hydrophobic tail. They disrupt the structure of the bacterial cell membrane by interacting with its phospholipids. Polymyxins have a bactericidal effect on Gram-negative bacilli, especially on Pseudomonas and coliform bacteria. Polymyxin antibiotics are highly neurotoxic and nephrotoxic, and very poorly absorbed from the gastrointestinal tract. Polymyxins also have antifungal activity.